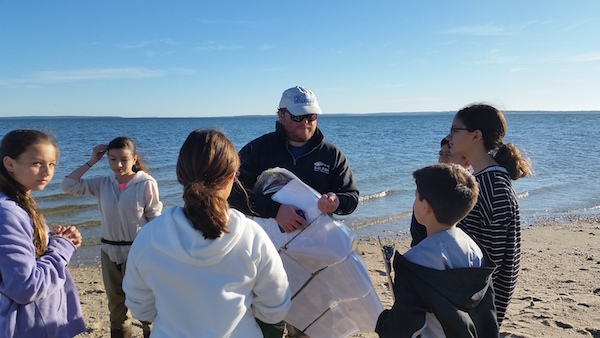 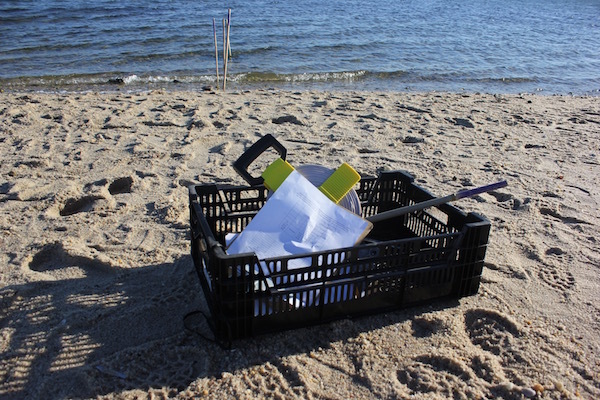 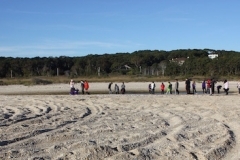 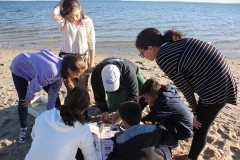 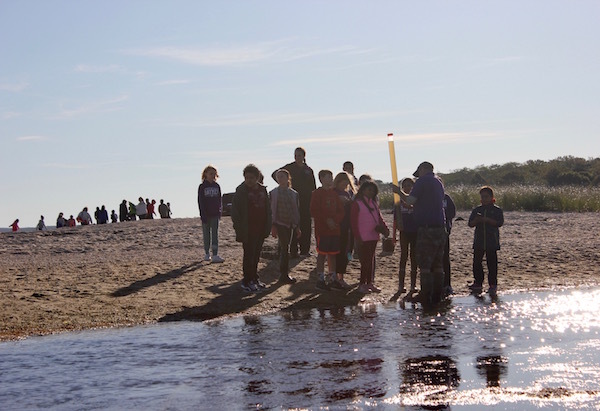 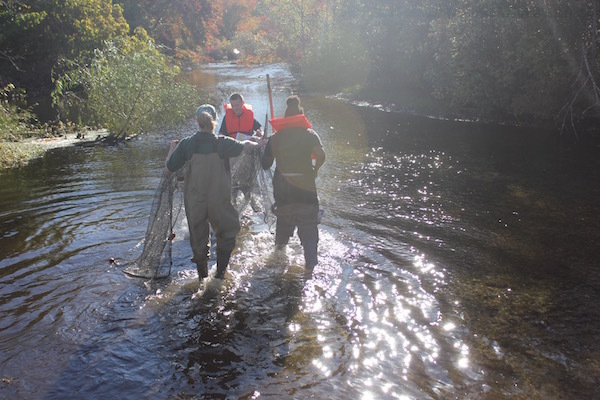 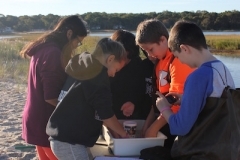 For the fourth year in a row, students at schools throughout the Peconic Estuary took to the shores on Oct. 20 to take the vital signs of the waters near their homes. A Day in the Life of the Peconic Estuary, an offshoot of A Day in the Life of the Carmans River, is a project organized by educator Mel Morris of Brookhaven National Laboratory, with the help of the Peconic Estuary Program, the Central Pine Barrens Joint Planning and Policy Commission and environmental groups and science teachers throughout the East End. 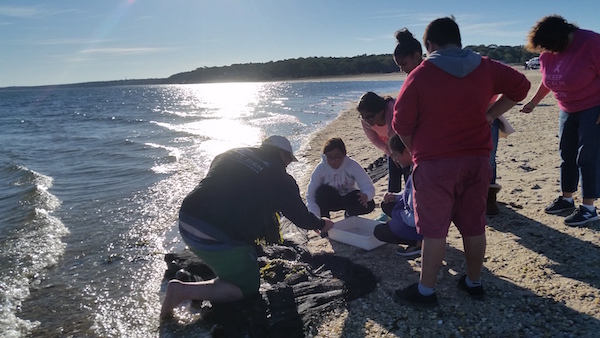 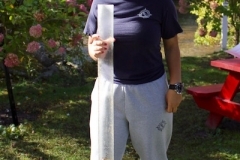 From Lazy Point in Napeague to the Potato Dock in Orient to Greenport’s Fifth Street Beach and Ram Island on Shelter Island, to Peconic Lake, which feeds into the Peconic River and eventually the Peconic Bays, hundreds of students spent a part of their day measuring the Peconic Bays at 16 different sites. 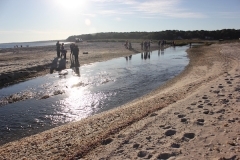 Each year, they conduct four tests: combing through their chosen site with a seine net and counting the marine creatures they find, measuring the acidity of the water, collecting sediment cores and measuring the tides, gathering a body of data that they can look back at, over the years, to see how the estuary is changing. 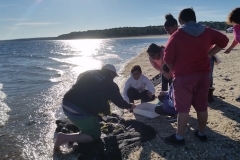 Hampton Bays Middle School science teachers Rick Nydegger and Lucy Dabrowski had two groups gathered at the inlet of Squires Pond off Red Creek Road early Friday morning. 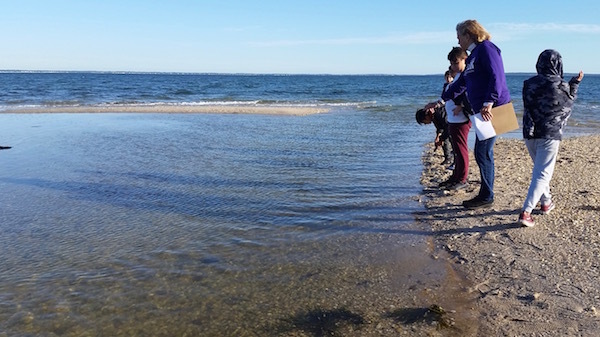 One was taking measurements in the inlet, and one was taking measurements of the open Peconic Bay, with help from Ron Gelardi of the sttate Demartment of Environmental Conservation and Peconic Baykeeer Sean O’Neill. 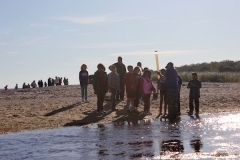 It was a great turnout, fitting for a school whose sports teams call themselves the Baymen. 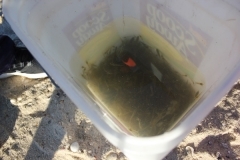 As students who had spent just a minute seining thousands of shrimp from the inlet mulled over the best way to count them all, Mr. Gelardi showed them a trick — find out how many shrimp it takes to fill a small container, and then fill that container as many times as you need in order to count the shrimp. Over by the bay side, Mr. O’Neill was helping the kids identify a banded killifish, then showed them how to tell grass shrimp and sand shrimp apart. “Grass shrimp have a long face and short antenna, sand shrimp have a short face and long antenna,” he told the group. 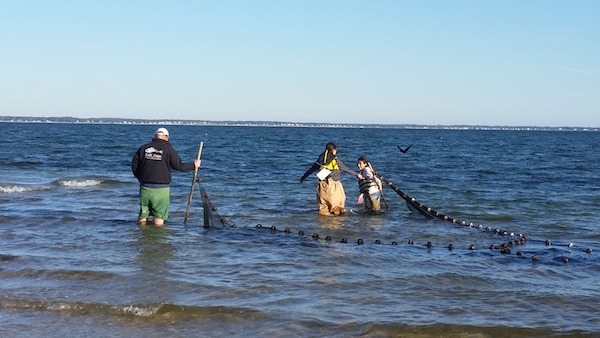 Two girls wearing waders then took their seine out for another pull through the bay, one wearing waders so big she seemed to be swimming in their depths, one wearing waders so small that the bay began to pour in over the top. 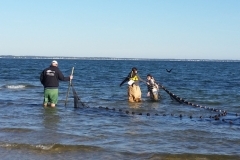 They helped each other back to shore. 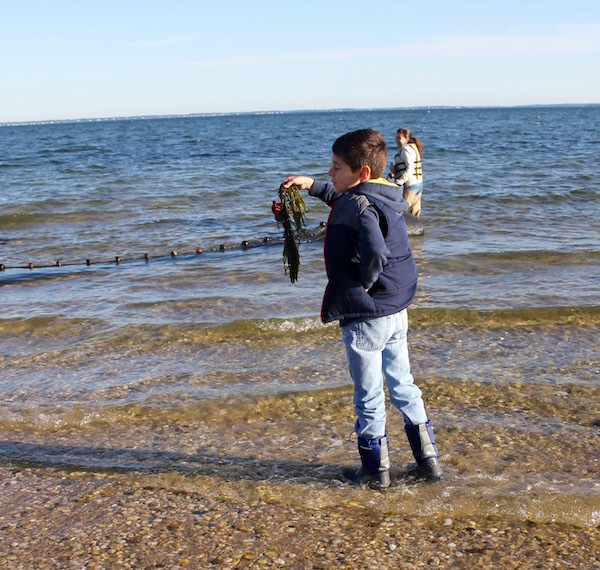 “I learned that Abe Lincoln fits in these pants, but I don’t,” said Maya Sanabria after she returned to the beach. 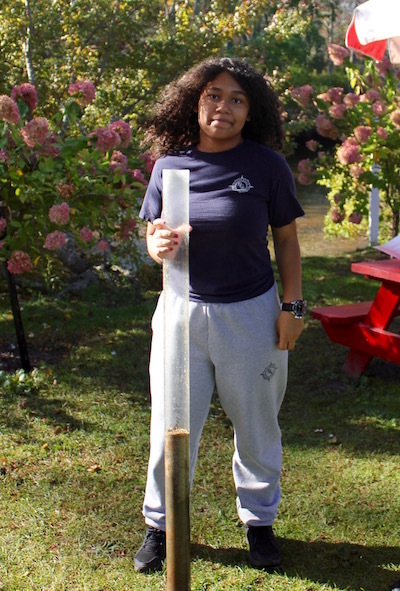 Despite being soaked, Valentina Vega said she was having a fun time. 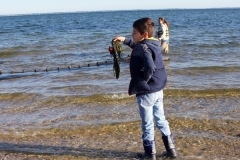 “We get to learn about the fishes, and what kind they are, similar fishes and how you can tell the difference,” she said, adding that the day has inspired her to want to protect the bays. 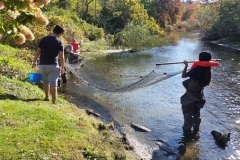 Over by Roadhouse Pizza on West Main Street in Riverhead, students from science teacher Mike Schlessinger’s class at the the Riverhead Charter School weren’t having such great luck seining creatures from the mucky Peconic River. 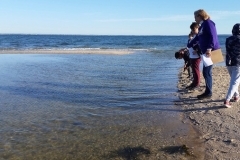 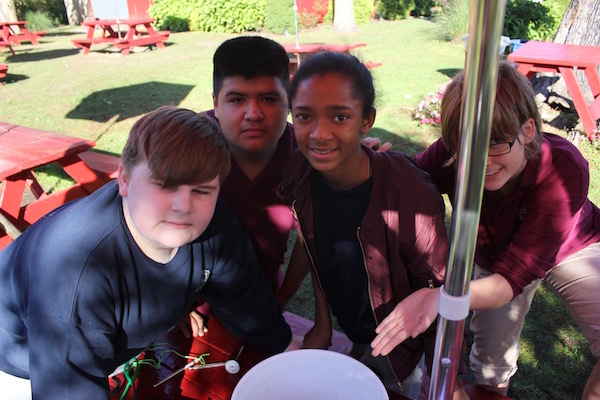 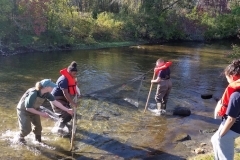 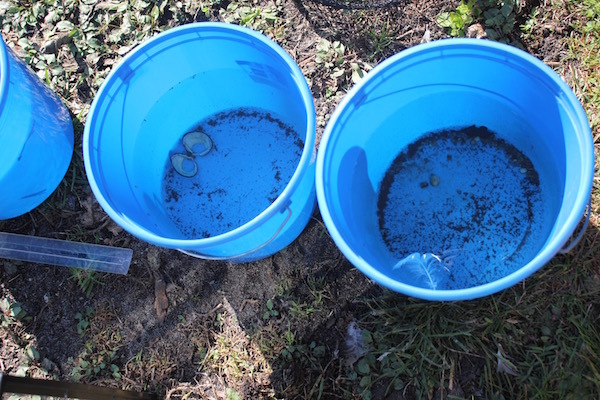 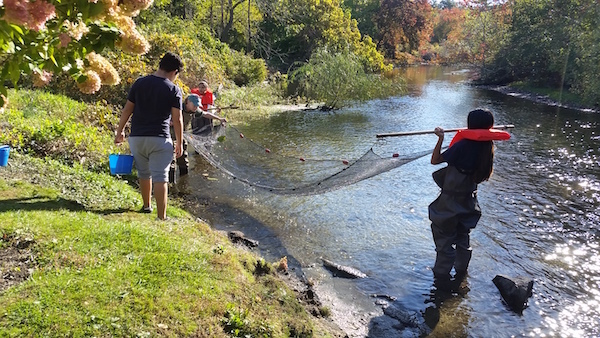 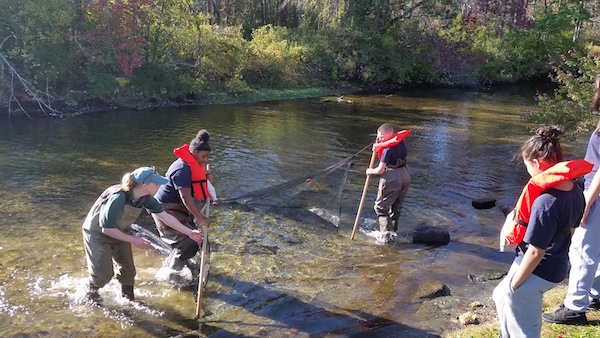 Eighth graders Christian Cognet and Reina Love took stock of their catch — a feather and a small dead clam, before the students returned again and again, hauling in nets in the shallow running water. 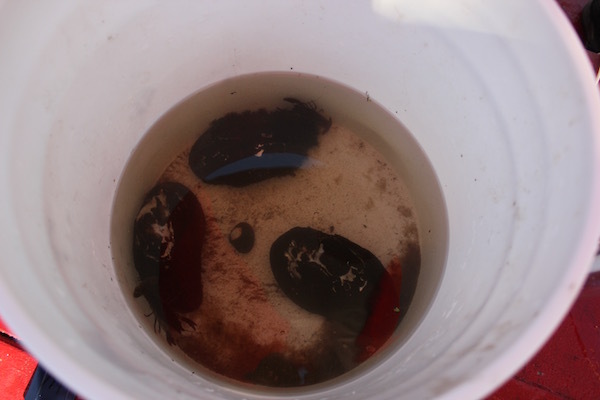 On a picnic table nearby, students Logan McMullen, Chris Lascano, Cherish Simmons, Jahnaya Sinclair and Anjuli Vaiana-Cavanagh were celebrating their finds — three oysters covered in river-bottom sediment and a pair of big shrimp, who were wrestling. 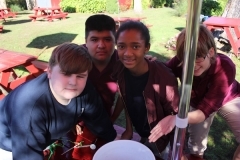 Next year, these students will pass the baton to a new group of eighth graders. 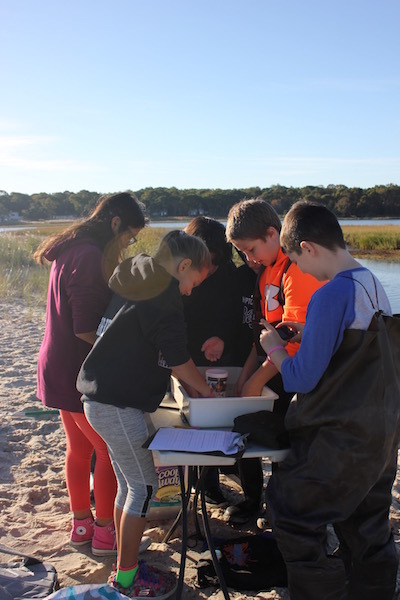 At the beginning of the day, they will be new to the process of documenting the ebbs and flows and comings and goings of this estuary system. 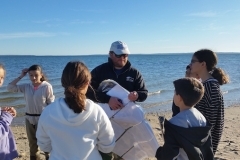 By the end of the day, they will have made their mark on a citizen science project that is only now in its infancy, but which shows great promise for the years ahead.